Tucked away on a private 482m2 block in the heart of inner city Paddington is this stunning, brand new dwelling encompassing two levels of stylish living. The entry level has a fantastic layout and is immediately striking. An internal courtyard terrace floods the entire space with natural light and acts as a link between the kitchen and the lounge. Sliding doors can be opened to create a fabulous, open free-flowing area, or you can leave them closed and enjoy a separation of spaces. 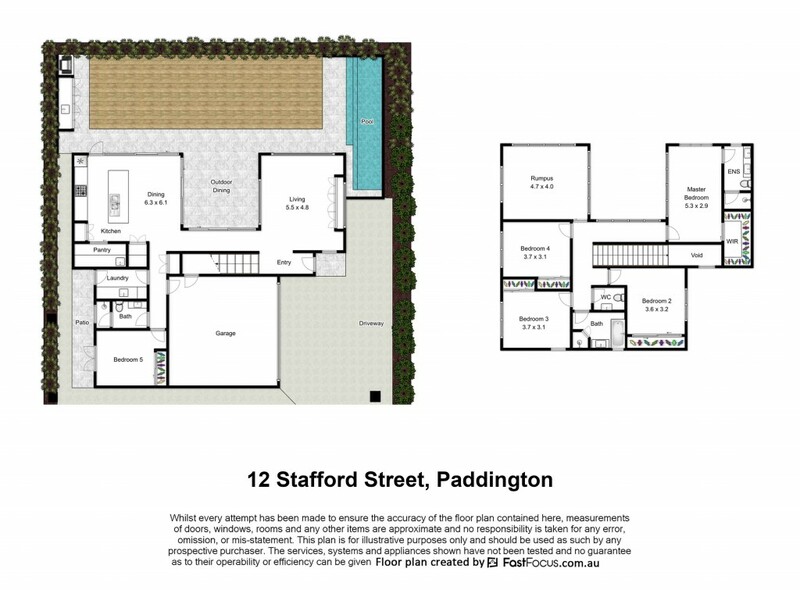 The tiled terrace leads to the pool, integrated BBQ area and yard - a perfect space for alfresco living and entertaining. The designer kitchen, with accents of timber and black is not only beautiful to look at it is also functional. There is a large stone topped island bench and Miele appliances, while a butler's pantry takes care of any storage needs. The laundry is also conveniently close to the kitchen as is a stylish guest bathroom and there is internal entry to the large double garage. There is a bedroom on this level with built-in storage and French doors opening to the side garden, which would also make an ideal home office. On the upper level you will find another inviting lounge area - perfect for watching TV or as a games room. There are four bedrooms on the upper level, including the Master suite, which has an ensuite bathroom and walk-in robe. The main bathroom has a bath and a separate powder room. This is a well-designed property, offering generous living spaces in very stylish surrounds. It is packed with designer features and has ducted a/c throughout and quality fittings and fixtures. The location is superb. It is 3km to the CBD and a short stroll to the boutiques, bus transport and lifestyle precinct of Latrobe Terrace, yet it is wonderfully tucked away from the hustle and bustle.